As you can see in the slideshow above, there is always a lot happening in the school. The boys and staff are working hard and loving learning daily. The best place to keep up to date with all the school news is on the school facebook page(shown below). It is far more efficient for finding out details or information about the wonderful work we, our boys, our staff and our parents do. So why not join the page! The School Facebook Page Policy is available to view under Policies on Menu page. If you wish to make an appointment to meet with the principal, class teacher or for assistance. 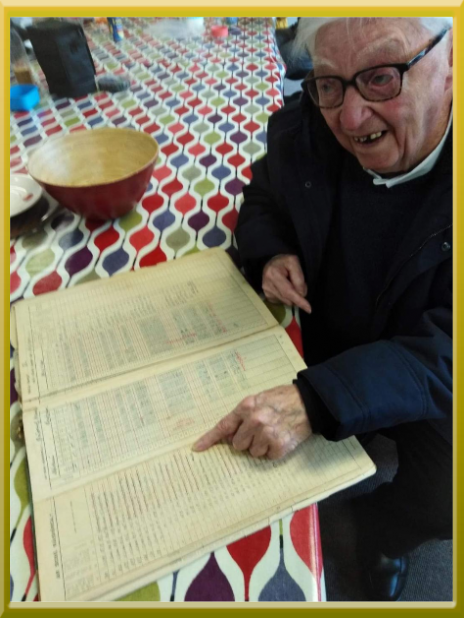 On Monday a special person visited use all the way from Wolverhampton in England and he was the first boy in the first class in the new school of St. Patricks back in 1937. Maurice Fitzgerald and his son with his wife came and Maurice is 91 years old. We were all surprised that he was one of the first boys to join our new school building. Mr McCarthy handed the microphone to Maurice and he started talking about the school and where it was. He also said that he loved the school while he was there. After that his son took over for Maurice and said that the school welcomed them very politely and handed it to Mr McCarthy. We sang the school son for him and he was delighted to see his Class Rolla from 1941 when he was in 7th class. What a legend! This was a great time for our school and I really enjoyed it. 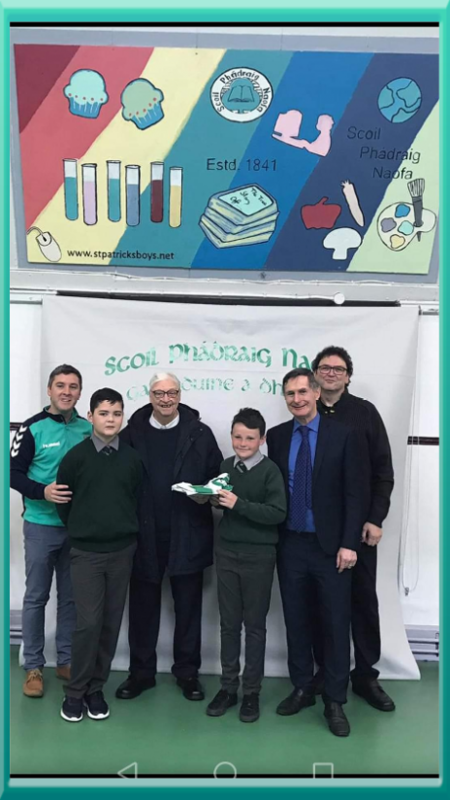 Leading up to this year's Presidential Election, Michael D. Higgins who officially opened Áras Phádraig when he visited St. Patrick's in 2013, would have been very proud of the boys of the school. 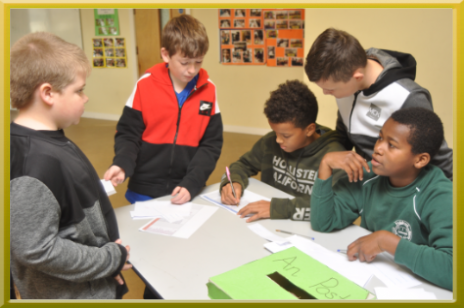 As the nation were deciding on who would become Ireland's President, with Ms. Kelleher's vision, and the boys throughout the school voice, voting for this year's Student Council Representatives in each class began. Any boy who wished to be a candidate was allowed to speak to the class on why he would be a fitting class representative. The class then had to decide and vote privately in the ballot boxes in Áras Phádraig. Spiderman even swung in for his vote under the watchful eye of the 6th class voting stewards. The New Student Council will be announced after Mid-Term at assembly. We are all very excited. The student council do amazing work throughout the school every year and this year will be just as busy for our leading boys. On Monday 16th April the two sixth classes from the boys school and the two classes from the girls school gathered together for this holy day.The boys and the girls gathered in the church for ten past ten.The mass started at ten thirty, the first of the prayes were read out by Sean and Niamh after Seans prayer there was singing, the response orial psalms were read out by Conor O' Callaghan,Daniel Mulryan,Conor O' Brien,Scott Lawler and Mislav Longin then Niamh read out her prayer.During the songs we the choir's singing was excellent.Then came the prayers of the faithful read out by Aoife,Kian,Julia,Lee,Sophie and Evan which were also excellently read out.Then came the main reason we were in the church,not for the singing,not for the reading of prayers, but to be confirmed.We were confirmed by Bishop Padraig O' Donoghue and Monsigner Aidan O' Driscoll.Soon after we were confirmed we all walked up to the top of the aisle to sing footprints in the sand.When we finished the singing we all went back to our seats.When the mass ended we were all given the decision to get photographstaken with the bishop.The whole mass was great all thanks to our teachers, and Ms.Kelleher who helpedus with the singing and especially the choir whos singing made the mass much better. It was the 13 th of March at 6 o’ clock when the Open Night started. We put a lot of hard work into cleaning, tidying, organising and preparing for the Open Night and when it finally came around all the boys were excited. My job for the evening was to interview parents after their tour. Evan Lane and I were waiting for parents when one parent came into the staff room! 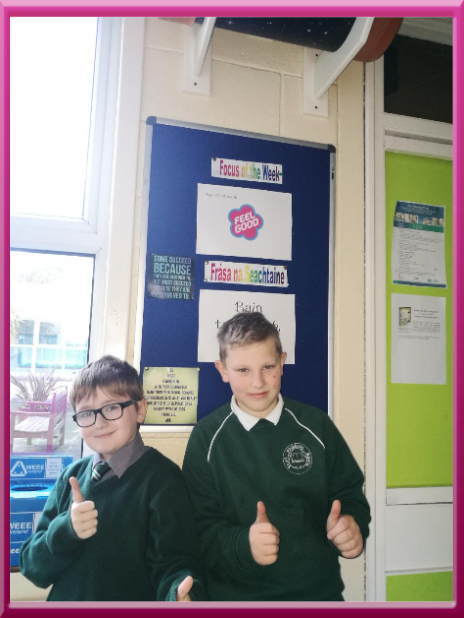 Myself and Evan interviewed the parent and asked a few questions like how was the Open Night, what did you like about the Open Night and what would you change about the Open Night? Then Ms. Murphy had to borrow Evan to be a tour guide but Ms. Murphy gave me Shane Murphy instead. He helped me a lot. Luckily more and more parents came and we interviewed them too. Most of the parents loved the free tea, coffee and biscuits and the participation of the pupils which was great. At around half-past seven more parents came and got interviewed. At the end of the day all the boys went home and had a great time as well as the parents. We hope it will encourage the parents to send their children to St. Patrick’s B.N.S. On Tuesday, the 13 th of March our school held our annual Open Night. I, Fahim, and Conor O’ Brien was presenting the computer room to all the parents and children that had come to visit our school. 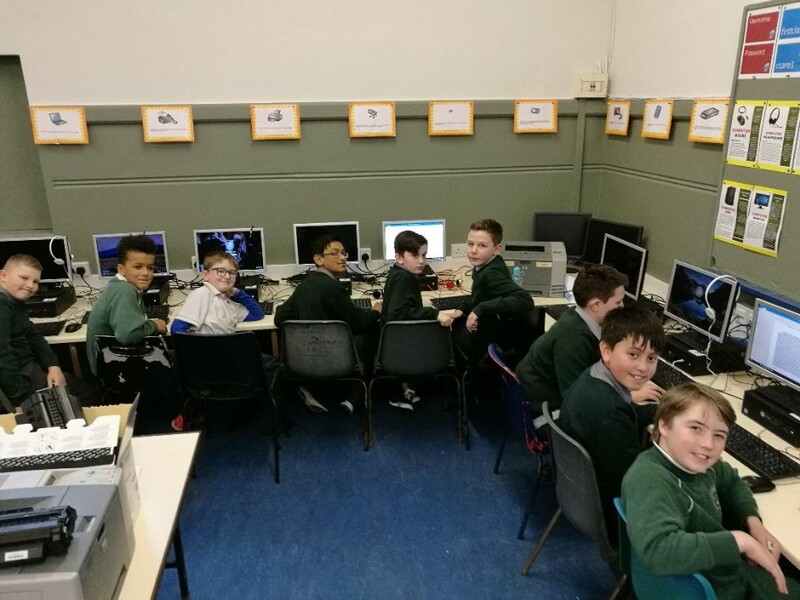 On the day we had both set up 5 sections of the computer room into; Prezi presentations, our website, our two educational games, Mavis Beacon and Big Brainz and finally a few reports written by the Reporters Group. The day before we had a short practice and after that we were ready for the big night. We arrived to the school at approximately 5:45 p.m. and that gave enough time to set up the computers and have a brief look around the school. It was nearing the time of the Open Night, 6:00 p.m., and we were ready for the masses of people coming to our fabulous school. Our first group of parents came at around 6:05 p.m. we had nailed it, we did everything we practised and we were very happy with what we had done. More and more people had come and we ended up having to split up and had to show everything by ourselves. It may have not been our plan but it didn’t affect us everything went smoothly. It was probably because we had expected so many people to come to our amazing school. We also had a little tea break as well with pancakes and cakes. We had a great time during the night and Ms. Lohan non-stop praised us. I was collected at around 7:30 p.m. when it calmed down a bit. I was wrong after I left I was told 3 more groups had visited the room but Conor handled it fine. The Open Night was a great success! The next day we were met with many praises from our teacher and also Ms. Lohan including a full homework pass for our brilliant work! We were very proud of ourselves and the whole school as well. At six o’ clock on March the 13 th the boys of St. Patricks BNS were buzzing with excitement because it was the school’s open night. There were many things to present such as science, Le Chéile, Maths Factor and many more. I’m going to be telling you what I did during the open night by representing both my class and the green schools in our school. I arrived with scruffy hair because I had to chase after my grandmother’s dog (how convenient) and I ran over to my station where I was greeted by my partner Corey Brooks. It was about half past six when the parents and their children arrived. My station got ignored for a little bit but when the first group arrived Corey and I got excited. We told the parents about our green school’s code, that we were rewarded with two green flags (sadly one of them were damaged in the snow storm), how we got the flags and so on. After the next few groups Corey and I decided to get chairs, standing for that amount of time was very tiring. After coming back from getting our chairs two groups came to us and one of the parents gave us a really helpful suggestion. It was to put an empty bottle of water outside when it was raining and the bottle could fill up with water and then we could use it for watering the plants. Corey and I were offered a cup of orange juice and we accepted them but that made us make jokes about how much we looked like news reporters. One last group and we could have a celebration. Corey and I went into the staff room where all the others were and had some biscuits and out of nowhere my mom and my sister are there. My sister had a lot of fun playing with the other boys. Around eight thirty we all left for home. Needless to say I had a great time and I hate to leave this school. Written by Seán O’ Callaghan. On the 19 th of January, ten lucky boys from the fifth and sixth classes went to a school’s basketball blitz in Neptune stadium. The names of these lucky boys were Oran R., Joshia L., Conor O’C., Conor S., Shane R., Corey B., Farham F., Adam O’H., Daniel M. and Jordan G. I interviewed Daniel and he felt confident and nervous and he likes the chant that Joshia made for him, YOU MAY BE SMALL BUT YOU CAN DO IT ALL!!! The transportation to the match was a garda bus, the boys had a really good time with their chants and chats. The first game started at half past ten. St. Patrick’s opponents were Padre Pio. It was a really exciting game. When the first half was finished, the score was 4 to St Patrick’s and 4 to Padre Pio. The second half was just as exciting, luckily the scores changed 14 to St Patrick’s and 8 to Padre Pio. It was a win for us. The after match interview was with Corey. He said he felt nervous at the start but when he got on to the court he felt confident. When half time was over he had a restored faith to win the game, when the game was over he felt happy and relieved. In Conor S’s interview he said that he was also nervous when he went on the court and thought they were going to lose when half time was over he felt proud because he scored the shot that drew the game. He felt proud at the end of the game because his team won. Coach Mr. Foley felt worried until he knew the team settled they will be great at half time he felt tense and he told the team that more shots equal more baskets equals more wins, he was very proud when the great team performance was over. It was a really enjoyable game and we wish we could replay it over and over again. Written and edited by Seán O’ Callaghan and Justin Kennedy. On the 19 th of December 2017 Ms. Fitzgerald’s 1 st class and Ms. O’ Connor’s 1 st class performed their nativity play for 2 nd class to 6 th. On the day the boys gathered in the hall where the 1 st classes were waiting to perform. The classes settled down to watch. Without warning the 1 st class burst into song. They were amazing. The following scene was of a stable where animals were arguing about the new stable and in argument started roasting each other. Then the first class started singing another song. Once again the boys were applauded, especially after their performance of an air guitar. After acting out the rest of the story of Mary and Joseph, with many great accompanying songs, there was an eruption of applause and the first class were given great feedback. One boy even called it Oscar Worthy. This is a yearly tradition in the school and the 2018 play should be as great as the rest. On Tuesday, all the classes from 1 st to 5 th went making Christmas cards with the 6 th class students in Áras Phádraig. When you came over to Áras Phádraig, the boys asked you what type of card you wanted to make first. The choices were a Christmas tree or a wreath, and I picked a tree first. First you had to glue 2 strips of paper and then place them diagonally onto each other on a piece of card. Then you just kept doing those steps until you reached the top of the card. For the wreath you dipped some wire into green paint and made a circle with the design of the wire. Then you put dots of red paint all over the wreath. Then you got to pick a bow or a ribbon to put on the end of the wreath. I admit it was really great fun making the cards with the 6 th class and I hope we do it again next year. We are really looking forward to delivering our cards to the Nursing Homes when wemake our visits this Christmas on the Red Fm Bus. We hope the elderly residents will like our artistic cards. This week, the 27 th of November till the 1 st of December is Feel Good Week. During Feel Good week, all classes do a relaxation period at 10 O’ Clock called 10@10. This involves colouring, meditation and mindfulness etc. for ten minutes every day. The Feel Good Week kicked off with assembly as different boys got up and told their good news to the whole school, some involved a new pet cat, a cousin turning 2, a mom getting a new job and a baby having a christening. Kirsten comes during the week to do meditation sessions with the different classes. This includes quiet time, and a game where you keep your hands still and someone moves them, then you guess whose hands have moved. Another good thing to come of Feel Good week is the box of kindness where when an act of kindness is brought upon someone, that person who is the recipient writes about it and puts it in the box where the end of the week it will be read aloud to the class. 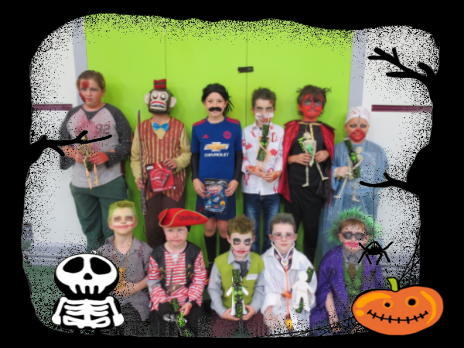 By Darragh Harris and Ryan Hurley 5 th Class. A play group West Midlands came to St. Patrick's School on Thursday the 16 th of November at precisely 9:45a.m to perform for the boys.. When they were ready the classes brought chairs to the hall and sat down, eagerly awaiting the start of the play. The play was called The Wizard of Willington and was about a sorceress's apprentice named William who was fed up with being asked to tidy up after his teacher and kingdoms sorceress, Mrs. Morgana. When King Arthur comes to the workshop he demands that Mrs. Morgana and William conjure up a present for the queen's birthday. They decide turn the queen into a ballerina for the day. But when William accidently turns the queen into a bag of sugar by mistake, he has to keep it secret from the king. William travels to the Glass mountain to ask the Queen of the Glass Mountain for a green emerald to restore the queen to normal. Once William returns to the workshop he casts a spell to restore the queen and turns her into a ballerina at last. Over the course of the play, many questions were asked to the audience. When asked what age he was one boy even said he was 98. At one point, two boys were asked to help tidy up the workshop. You have never seen so many boys volunteer for cleaning. After the play we interviewed the actor who played William. Our first question was, ‘What was the name of the play that you most enjoyed acting in? His answer was; The Firebird which had also been performed in front of our school 2 years previously. ‘William’also told us that he has drama qualifications and has acted with this specific acting group for 10 years. Each play, on average, take about 12 weeks to perfect. ‘William’ said that he feels great when acting. Our last question was ‘Who wrote this play and how did they get inspired. The actors reply was that it had been written a couple of years ago but he had re-written some bits for the performance. We thanked the actors and complimented them on a job well done. Every boy in the school hopes that this West Midlands comes back to perform many more times. In September of this year the school football team started training up in the Tank field, our home pitch, with Mr. Horgan, Mr. Foley, Mr. Walsh, Mr. Mullins and Mr. O Mahony. We are learning lots of skills thanks to all the teachers training us to our best ability and they are also helping us get ready for our matches. I like to be either centre forward or wing forward. We are training very hard for Sciath Na Scol 2018. We have had a few matches and one tournament already in football. Our 1st game against Scoil Eoin. It was a hard fought match but Scoil Eoin turned out as the better team with 4 points more. We learned from that game that if we are winning we have to keep up our best because in the second half they got the better of us when we thought we were definitely going to win. Our second match against Glasheen was a fierce match as well. Glasheen were a tall team so they had the advantage but we tried our best and kept it that way and we barely beat them. It was a great match. Our most recent match against Blarney St. was our easiest game as we beat them greatly. Blarney St. gave it their best but we just had the advantage on them. Our third match against Togher we won greatly again and now we are all proud to say now that we are in the Semi- finals. We have lots more matches ahead including challenge matches and tournament matches. We will do our best and hopefully we will win The Sciath na Scol! Also, Mr. Horgan entered us into the mini 7’s which is a tournament for children who were born in 2006 and whatever team won could pick one player to ref in Croke Park. The tournament was played in the Mayfield pitches. It was very hard as there were a lot of country teams who were pulling and dragging. The first team Ballinadee we were beating them for most of the game until the end. We drew and then they scored the winning point. The second match we lost by two points because of a goal at the end of the match. Our 3rd game against Gaeilscoil Kinsale who we beat. 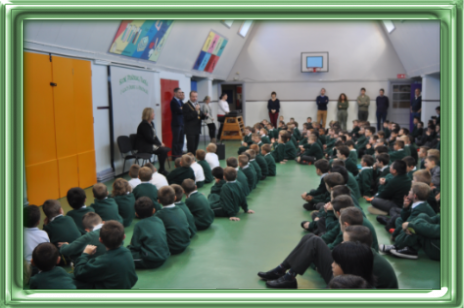 Coláiste Chriost Rí: On the 7 th of September on a Thursday Mr. Foley and Mr. Hayes from Chriost Ri secondary school came to visit the two Sixth Classes and inform us about their school and why they recommend it to us. Firstly, they showed us a video of their facilities. After this video we were allowed to ask some questions. They told us the date of the open night [13 th/9/17]. Deerpark C.B.S: A couple of days later [3 days later to be exact] on the 10 th of September Deerpark C.B.S came to persuade us to come to their school. Mr. Barry came to represent his school, they also showed us a video of a few primary schools visiting their school. The children in the video looked very happy as they were served a French breakfast. They did activities such as woodwork and metalwork. Christian Brothers College: On the 18 th of September the science teacher from Christians came to visit us and invite us to their open night. He gave us leaflets that have information about their school. He told us where it was and let us continue working. Mayfield Community: On the 23 rd of September, Mayfield Community Schools principal Mr. Golden also visited the two sixth classes to inform us about their facilities such as astro-turf pitches, a gym and a swimming pool. He also told us about all the subjects they have. We asked him some questions and he left. St. Aidan’s: On the 25 th of September St. Aidan’s came to visit us and inform us about their school. Two former students Olan O’ Brien and Adam Lawler came with two girls and their principal to tell us why they think we should attend their secondary school. Then we had time to ask questions and then they said goodbye and left. The Brand New Computer Room!!! The computer room is an amazing facility with 22 new desktop computers which are tremendous, a black and white laser printer, fibre fast broadband with windows 10 and a fabulous projector. This astonishing design was set up by Professor Butler (Ms. Butler’s dad) from UCC, and Declan O’ Flynn and a group of IT experts from the GRTC http://www.grctc.com/grctc-go-back-school/ and the stunning painting by Harry Varian. The cost of the new computers was a humongous 15,000 euro!!! The money came from our department of education, school board and super helpful Parents’ Group. Mr. Foley, Mr. Lettis and lots of boys around the school helped to set up the computers and the helpful displays and posters that make the room look so modern. Shane and I and lots of other 6 th class boys’ helped set up the new computer room. The computer room is used for many different reasons such as EDUCATIONAL games, meetings and much, much more. I hope you enjoy the brand new computer room. Thank you to everyone for helping us to have a computer room. Ms. Harrington's Class love Shared Reading with the Secondary school leaders. "I really like reading the cool books with the girls from St Patrick’s secondary school. The girls are really friendly and helpful. They bring us books for us from the library. Some of the books are about monsters and others are about cats and dogs. My favourite book I’ve read so far is called Crocodile in the Swamp. Shared reading is a fun way to practise reading. I like listening to the exciting stories and then reading my book to my partner". The New First Class were scared because they had never been in a big boys’ school before. 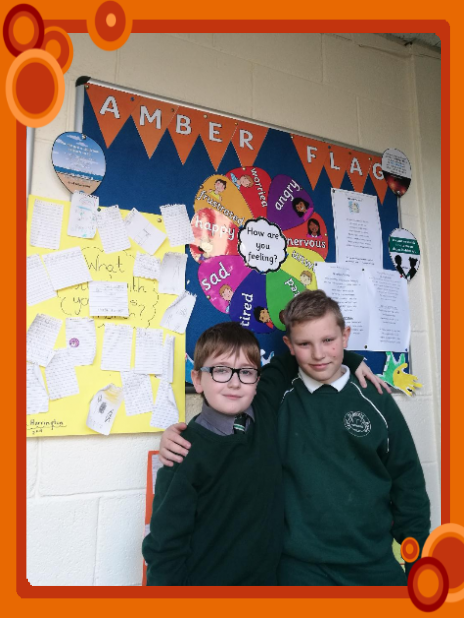 James Duffy and Ian Esteron were working together to interview two boys from 1 st class and ask them questions about their new school. James was asking the questions and Ian wrote their answers. The boys that the teacher picked were the two James from Ms. O Connor’s class. One of the James was a bit shy but the other was happy to answer the questions. The two of them don’t miss senior infants and they like their new teacher. They have made two or three new friends and understand the rules. They love sports and their favourite subject is Maths. They are learning how to use the computers in the computer room. We asked them what do you think of the hours since in senior infants the hours are shorter, but they didn’t seem to care much. On the 23 rd of May, St. Patrick’s B.N.S. hosted a cake sale over in the new building, otherwise known as "Aras Phaidrig". Each boy had money to buy cakes to promote the school in funding terms. So maybe for affording new equipment or just for more money for behind us for a rainy day. But anyway, some of the fourth class boys were the shopkeepers, as well as the parents who were just a bit more efficient for making calculations and to not keep us waiting for six hours straight. So on the 4 th of May our school are going on a sponsored walk around Mayfield at half nine in the morning. We are doing this to raise funds for our school so we can buy resources like new computers, sports equipment and new desktops and more. So all of the boys got this green leaflet so we would know who sponsored us. So the boys could go around their estate or could ask family or they could get their mom or dad to bring the sponsor card to work. The least amount of money you could bring in is €20. If you brought in €100 or more you would get a €20 Smyths gift card. If you brought in money you would be entered into a raffle so you have a chance of winning a €20 Smyths gift card. We would like to thank the boys for bringing money in to help the school. Mayfield G.A.A junior hurling team came to our school with three trophies in January. One was the County cup, one the Munster cup and the most important one of them all was the All-Ireland final trophy. They came at two o’clock to the halla where our excited boys were waiting. They showed us the trophies and said a few words to us about their experiences in playing and winning the trophy. Mr. Horgan said there are a few boys from your club who wish to ask the players a few questions. Jack McDonagh (1st) Jack Burke (1st) Darragh Flynn(3rd) , Conor McDonagh(5th), Thomas Holland(6th), Adam O Halloran (4th) and I, Raymond Costin (6th) asked some interesting questions to Nicky Kelly (Captain), John O' Donovan (Player) and Clive O' Donovan (Chairman). Before they left the halla they told us we could have no homework! We were delighted! It was great to see Mayfield winning the All –Ireland especially with our St. Patrick's pupils on the team. On the 21 st of March 2017, my mum, dad, uncle and I went to the cork county spelling bee final. I was the only St. Patricks representative at it as I won the school spelling bee. I was a bundle of nerves when I walked in the doors of the Rochestown Park hotel. We walked up two flights of stairs to a big hall, where I registered and got my spelling bee t-shirt. The room setup was 60 seats at the top facing the audience of about 150 seats. I sat down with my family and waited for the spelling bee to begin. When everybody arrived, they called up all the spellers in groups of 10. I was in the last group to be called. First we had a practise round, where someone spelled ‘towel’ as ‘towl’ and ‘enough’ as ‘enuff’. When the real competition started, it was nerve racking waiting for your turn. So the spelling bee went on. In the first few rounds we lost about 40 children. There were only about 22 left in the 6 th or 7 th round. The round started, before I had my turn, 6 people were out. When it got to my turn, I was given Leprechaun. I stood up and spelt ‘Leprechaun’. I was out. In the end, I finished joined 16 th out of 65. I collected my dictionary and goodie bag and left the spelling bee, both disappointed and happy. I had a great day, and maybe I’ll get a chance again next year! On Tuesday we had an Irish quiz. There were 2 quizzes 1 for 123 and a second for 456. Team LOL won the junior quiz and team 5 won the senior quiz. There were 5 rounds and my favourite round was round 3 because I knew what most of the answer were. Every class learned a song in Irish too. ‘Beidh Aonach Amárach’ was the song. I had a lot of fun learning it. The entire school went to sing it in the halla at the end of the week. We also did a céilí mór out in our gigantic lower yard with our Irish dancing teacher where the kids, the staff and teachers were dancing. We each had our own partner and for one dance, even four per squad of Irish dancers, we called it the quad squad. We also, on Thursday, had a big walk, a Siúlóid Glas, all up around St. Luke’s, near town and the army barracks and back down by the grotto, across the road and up the steps and past the Girl’s school building. We then went through the gate to our own school, in all it took us about 45 minutes to do the walk in full. We were all wearing green clothes and St. Patrick’s Day accessories. On the way, we held banners that said Scoil Phádraig Naofa. We sang our school song as we walked. Bhí an craic againn! We had a lot of fun learning and speaking Irish over the two weeks. On the 15th of February the student council/ green schools committee met up at 9:15 because a lady came to the school to check on how we are doing with our bins. She came to see if we can keep the green flag and if we can get the second green flag for energy. She came and asked us questions about what we do to check up on the classrooms bins. We told her that Mr. Duffy calls out the scores every week at assembly. Also, every Friday the boys in sixth class come around to each class to check our compost bins. Every week we can pick one boy from each class to do litter patrol around the school. She was very impressed with our recycling. She even asked the boys in the student council to go to another school to tell them tips and tricks on recycling and which bin to throw certain waste into. Then, we showed her some power points made by sixth class on composting and recycling. In order to get the energy flag we have to watch our energy use. If we get the second green flag four boys will be chosen to go to the Radisson to get it presented. In early September , Mr. Horgan announced at assembly that the school would be taking part in the Sciath na Scoil tournament. For the first few weeks we trained non-stop and in early October we played our first match against Scoil Owen in Ballincollig and we won barely by 2 points and silly mistakes. Our next match against Glasheen was a dominant performance and we won by 13 points. The week after we had a break so we done 2 solid training sessions. The next Wednesday we played against Blarney Street. It was an unbelievable match. It was neck to neck till the last few minutes, Mr. Horgan told the team to push up. Michael Lane received the ball and popped the ball over the top to let Oran Ross run onto it. With a last gasp effort he picked up the ball and scored a beautiful goal. The final score was St. Patricks 3-4 Blarney St. 2-4. Our last match was by far the easiest against Togher B.N.S. We beat them by a big margin. Now we had one week of training, where we had to get everything pitch perfect. The day of the semi final came around against Passage Star of the Sea. It was a really tight game with both teams equalling each other. Eventually Passage got a break through goal. When the last whistle blow all of the St. Patricks sat on the ground in misery. That was the end of St. Patricks journey and it was a silent walk to the school! On the 1st of December 50 lucky boys got to go on the Red Fm bus to go to four nursing homes to deliver Christmas cards to elderly people all around Cork. The boys left at 10 past 9 in the morning. We all brought Christmas hats to bring Christmas spirit. Tv3 came along aswell to interview a few boys. Every boy got a Christmas card to give to an elderly person. We also sang Christmas carols and songs. When we were done singing we could have a chat with the elderly people. The very last nursing home we went to was St. Luke’s nursing home. Before we went in we got a picture with our Christmas cards. It was a really good experience for all the boys. And we just want to wish the elderly people a Merry Christmas and a Happy New Year. St. Patrick’s B.N.S. again participated in the wonderful national Maths Week initiative which was held from the 15th to the 23rd October. This was the most successful year to date with thousands of children throughout the country joining in on the fun. The purpose of this nationwide celebration is to promote a positive attitude towards Mathematics, to help raise confidence among our pupils, to demonstrate that Maths is a life skill and to prove that Maths can actually be enjoyable! Ms.Murray(HSCL) organised many engaging activities for the wider school community e.g. ‘Maths trails with Parents’ were held with the 1st classes of Ms.Fitzgerald and Ms.Fitzpatrick; the 5th class pupils of Ms.Murphy helped the senior infants on a Maths trail etc. The brilliant ‘Maths Puzzles for Parents’ idea was also launched. Well done to all who submitted entries and the lucky winner of the voucher was Steven Walsh, father of Tommy Walsh in 2nd class. Competition was generated among the pupils in every class and those that were deemed to have put the most effort in were awarded ‘Maths Champion’ medals. These Mathematical Magicians were Tommy Murphy, Daniel Meade, Charlie Barrett, Madou Sidibe, Luke Byrne, Seán Ring, Samuel Kumurkiewicz, Joshua Martin, Lee Butler, Kevin Lin and Ben Heffernan. Well done to all, teachers, pupils and boys who put a huge effort into organising and participating in such a wide variety of activities. Our hope is that a greater interest in Maths has been generated and that our boys now see Maths as an essential skill which is used in many areas of their everyday lives. We are looking forward to meeting you this Wednesday or Thursday the 26th and 27th of October for our School Parent Teacher Meetings. Your son/teacher will inform you by note/journal of which day and time has been scheduled for you. Boys will finish on Friday at the usual time of 2:30 for the Mid-term break. 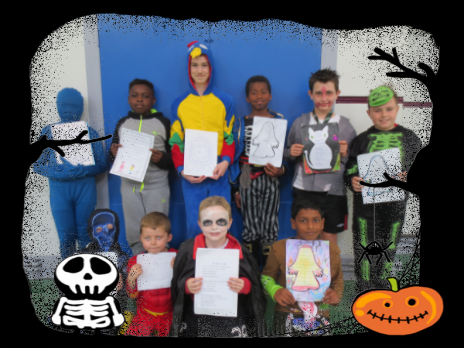 The boys and staff always enjoy the Halloween no uniform day. Have a great Halloween. Welcome to our First Class Pupils. They have transferred from the Infants school and are already part of everyday school life. We are very happy with their beginning in the Boys' school. 1. Thomas Kent was a hero back in 1916 and still is today because he gave his life for Ireland to be a better place. He died because the British soldiers raided his house in Castlelyons near Fermoy in Cork, but instead of surrendering he started shooting back. Thomas Kent was sentenced to death. 2. Thomas Kent was shot at Cork Detention Barracks as a result of a court- martial, British soldiers came in and arrested him at his home in Castlelyons, Fermoy, Co Cork. 3. Thomas Kent used to be buried at Cork prison until the summer of 2015. 4. Thomas Kent made the ultimate sacrifice- his life to save Ireland’s freedom. 5. Thomas Kent was not afforded a proper burial and he lay in an unmarked grave in Cork Prison until September 2015. On the day of the state funeral, the 18th of September, my class with Mr. Foley and Mr. Lettis walked to Rathmore road to view the procession. There were lots of other classes from St. Patrick’s Boys’ and Girls’ schools there to pay our respects. We stood by the Barracks wall and waited for the cortege car to arrive. After about 40 minutes we finally saw the cortege car with the coffin in the back and also 15 Gardaí on bikes. We stood silently and watched the green, white and orange flag pass us on the coffin of a Cork hero. After that all of us went back to school. 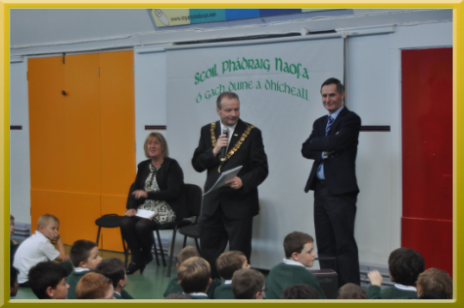 On Tuesday the 22nd of September 2015, the Lord Mayor of Cork, Christopher O’Leary came to visit our school. We are very lucky to have the Lord Mayor come to visit us because he has lots of places to visit in one day. Christopher O’Leary is from the Sinn Féin party which is one of the political parties in Ireland. When he arrived, we gave him a warm, St Patrick’s School welcome. He gave us a speech about friendship, and that we should always stand by our friends. We sang our school’s anthem ‘Scoil Naomh Phàdraig’ and he said that he would allow no homework if we answered two questions right. Although we were happy to pass, the teachers weren’t! Other than that the, Lord Mayor gave an inspirational speech that made everybody think twice about hurting their friends feelings. On the 28th of May 2015, we held our annual Parents Group cake sale in the amazing Aras Phadraig. Mr Foley's 4th class were supposed to help sell the cakes with the parents but the parents volunteered to do it themselves. Our class went over to buy our cakes at quarter to twelve. I and many other boys brought in €5 and it was good for us because the cakes were cheap. Most of the cakes were made by boys parents. We had five minutes to buy our cakes so everyone started to go into the cake frenzy. With €7 in his pocket, Alex McCarthy bought 20 cakes in the space of five minutess. After the cake sale had finished, we finished off the day by watching a movie while munching down on our cakes. To conclude, the cake sale was a great success. Thank you to all the parents and Parents Group who helped our school by baking, buying and selling. There was €781 raised for the Parents Group. On Wednesday the 20th of May, Mr. Foley’s class went to the Collins Barracks Open Day. We went there because Michael Doyle’s dad gave us a free pass to look around. Half an hour before we went, it started pouring rain. We were all very disappointed because we had to go up there while we were getting soaked. Luckily, the scorching sun dried it up in ten minutes flat. We walked around. We got split into two groups and some of us even got our faces painted. We got to see and try out sniper guns, rpgs, cannons and camouflage suits. There were gas masks and a chemical truck. I was listening really hard so I got a gold badge. We looked around some more, and then we gathered around the display square. Mr. Foley brought us to the display square and we saw soldiers launching a pretend rocket. We headed over to the military museum and into the badges room. Overall, it was a lovely experience holding guns and getting into tanks and I hope we can come again next year. Fiona Hayes visited our school on Thursday the 16/4/15. Fiona was holding the Six Nations Rugby Cup. Fiona trains on Tuesday when she goes to the gym at ¼ past six. On Wednesday Fiona goes running on the field and sometimes on Sunday Fiona may have a match. Some boys from our school asked her questions. Now maybe we will talk about Fiona when she was young. Her favourite sports were soccer and GAA. Fiona always made dirty tackles in soccer so she realised she should play rugby. When Fiona’s mum heard that Fiona wanted to play rugby she was shocked. In her first match she even had a big cut on her forehead. She is from Limerick. Now she works for the Glen Resource Centre and she lives in Cork. Some boys got signatures from Fiona Hayes. 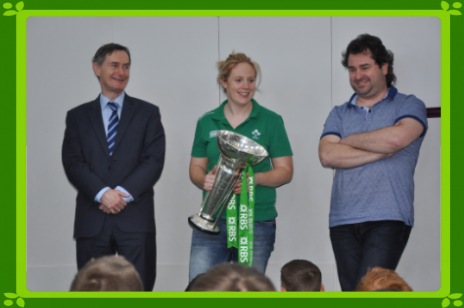 It was a great time meeting Fiona Hayes, one of our best rugby players from Ireland holding up The 6 Nations Cup. To champion the diversity that Polish people bring to Ireland, PolskaÉire 2015 was established as a nationwide festival to coincide with the UEFA Republic of Ireland versus Poland qualifier on the March 29th. The initiative was led by the Minister of State for New Communities, Culture and Equality, Aodhán Ó Rí¬ordáin T.D. (Department of Arts Heritage and the Gaeltacht and Department of Justice and Equality), the Embassy of the Republic of Poland in Dublin and the Football Association of Ireland. The festival was supported by Dublin City Council and other local authorities, along with many Polish organisations and cultural, community and sporting groups across the country. It is estimated that there are presently 150,000 Polish citizens living in the Republic of Ireland resulting in Polish becoming the second most widely spoken language on the island. 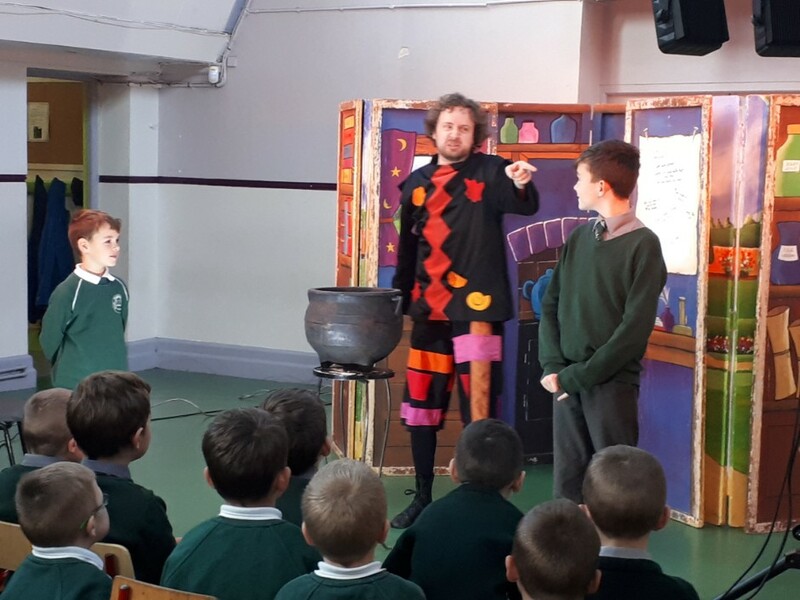 Throughout the week, a number of cultural and sporting events took place including Easter craft workshops, Polish piano and poetry evenings, intercultural dance festivals, short film showings and a host of other events across the country. 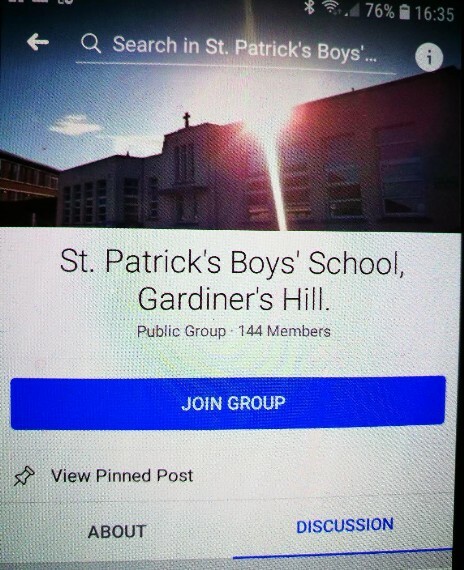 Boys from St. Patrick's B.N.S. 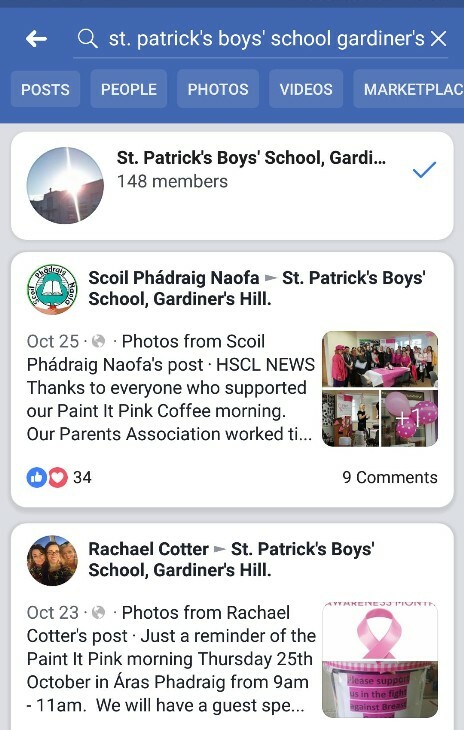 on Gardiners Hill were invited to play a friendly game against students from the Polish school who use the same building situated between Ballyhooley Road and Gardiners Hill. Monika Okuniewska and her colleagues have used St. Patrick's school since 2007 as a base to teach children the Polish language on weekends when their normal school week has ended. The principal played a pivotal role in setting up the friendly game on March 21st and it was the first shared venture between the schools despite sharing the same building for the past eight years. The morning of football kick started with a Republic of Ireland side taking on Poland and an exciting encounter ended scoreless despite plenty of goalmouth action. The game was followed by a tournament which integrated all the children into mixed teams. Six games followed and it was especially encouraging to see both boys and girls competing in the tournament on the day with Polish supporters lined up to give vocal support to all children taking part. Irish and Polish flags were provided for the supporters and following an action-packed morning of football, Monika Okuniewska provided teachers from St. Patrick's B.N.S. 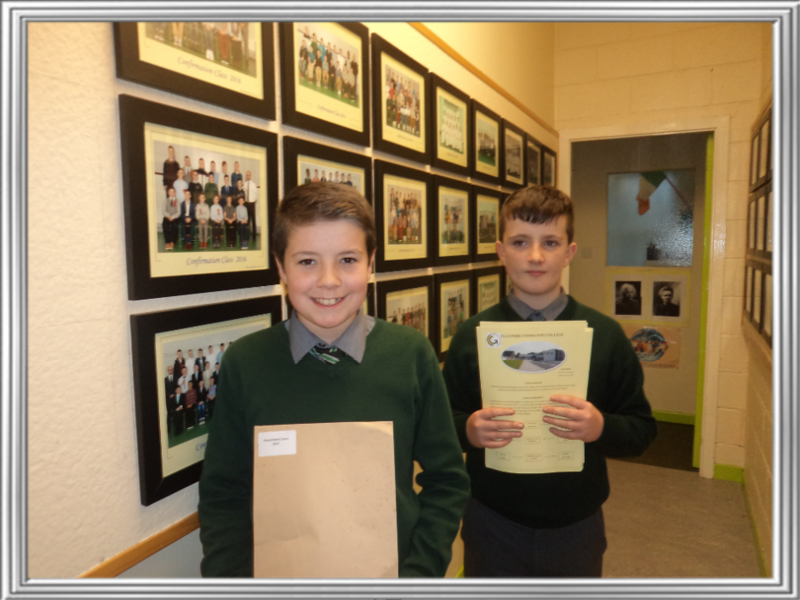 with a plaque and footballs thanking them for taking part in what is hopefully the first of many events between the schools.Ronan Lettis and John Mullins, teachers at St. Patrick's ensured the smooth running and refereeing of the exciting games. The PolskaÉire festival ended on March 29th after numerous successful events took place over nine exciting days and the 1-1 draw between Ireland and Poland at the Aviva Stadium was perhaps a fitting way to end a memorable time for both countries. At school, we have many programs and education to promote healthy eating and exercise habits for our boys and staff. We have Lunchtime Pals at break times, Irish Dancing, P.E., Afterschool sports, Swimming, Walk on Wednesday, free Fruit for pupils and we have just added another lesson to keep our hearts and lungs healthy. Each Monday, the boys will partake in a 5 minute exercise circuit in the school yard. This initiative was inspired by this years Operatioin Transformation on RTE. Why not try to copy our boys in your own workout!